Ethics Quiz: A Minimum Wage Lecture Instead Of A Tip? Is this an ethical protest? My view? There are minimum wage employees in bars and restaurants, but waiters and bartenders often aren’t among them. 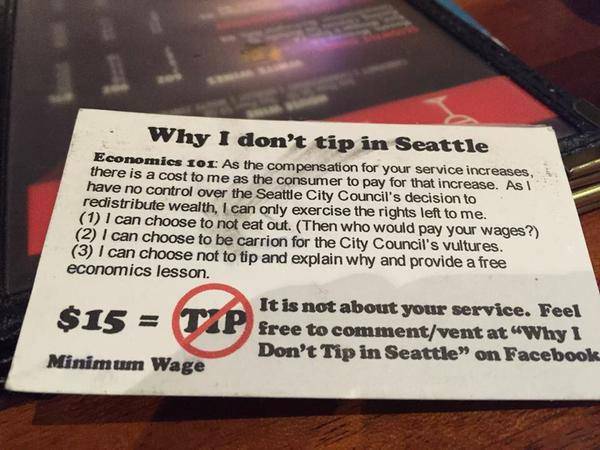 In the case of the bartender who publicized this patron’s printed rant, we learn, he is not a beneficiary of the minimum wage increase, and his livelihood depends on tips. A tip, as Ethics Alarms has stated before, should be based on quality of service. To withhold a tip from a server or bartender—which should be message about service—to register an objection regarding the city’s wage statutes is neither logical nor just. Among the card’s three options, the first is completely reasonable, the second is a necessary consequence of living in a democracy, and the third is just behaving like a jerk. I bet the guy that left this card kicks his dog after a bad day too. ← “Albuquerque Fire Chief Evaluating Training After Dispatcher Hung Up on Caller”? Why Yes, I Think That Would Be Prudent! This seems a bit too easy for a quiz, for all the reasons you provided. Whoever left this card is a fool, and his misguided protest definitely did more harm than good. Unethical. Many people fail easy tests. This says more about the test-taker than the test. P.S. It’s “by-product”, not “bi-product”. I’m just glad I spelled “product” right…. Let C be a category with zero object. pl ∘ ik = 0, the zero morphism Ak → Al, for k ≠ l.
(A1 ⊕ ··· ⊕ An,ik) is a coproduct for the Ak. An empty, or nullary, product is always a terminal object in the category, and the empty coproduct is always an initial object in the category. Since our category C has a zero object, the empty biproduct exists and is isomorphic to the zero object. Yes, it is. The Spelling Nazi withdraws in shame! That would be me though… I think we’d have to withdraw together. This particular Wisenheimer’s ancestors passed through Ellis island, the immigration official misspelled their name and the family adopted the misspelling as part of their new distinctly American identity. An elementary mathematical equation doesn’t require a comment. Are you permitted to take your laptop on vacation? Your spouse has a more laissez faire attitude than most I know. My ancestor shortened the last name to 10 characters at Ellis Island, because that’s what fit. It just occurred to me that it looks like I was posting about myself. Though my German ancestors did have to transliterate a ß leading some branches of the family to adopt odd spellings, this particular comment of mine wasn’t serious. It was meant to be a lighthearted jab at zoebrain’s quibble. It’s truly idiotic. How does this guy know that the one serving them supported the $15 minimum wage or not? Leave that note with Seattle’s idiot mayor. He’s the one that may well cost your waiter his job. Blame him. Blame the union goons. Don’t blame your waiter- especially if he did a good job for you. Tipping is voluntary, and though I understand that tipping is for good service, we also reach a level where tipping becomes absurd (you don’t tip your surgical team, no matter how well they do). It seems to me that if you ratchet the wage upward in an unnatural way, it should maybe be expected that the culture will have a discussion about whether tipping is going to apply in this situation anymore. The card, clumsy though it is, is at least letting people know the position of the customer – he or she didn’t forget, and is not claiming bad service. It could, in fact, be said that he or she is participating in a dialogue about the future of tipping. I think we have to assume that even if the law doesn’t cover that specific bartender, he or she is still getting the benefit of the law. Otherwise, he or she would just go across the street and work there for more money. Or, you could be a slightly informed person and know that the law doesn’t apply to any normally tipped workers. Going across the street isn’t going to help. If the leaver of this information didn’t know the law didn’t apply to tipped workers, then that person is even more unethical. Great with it until I got to # 3. How many people actually know who is and isn’t a minimum wage worker at a bar? Here’s a hint…read your local law. How many people will actually do that? If our city council is any indication, zero. By the bye, a small technical question…have I inadvertently done something to be banned? I keep checking the Notify me Of New Comments box and have gotten no such notifications for like 2 weeks. Or have I screwed up my browser? Really? If you’re a proponent of a law to the point that you’re handing out cards to random people, you should, maybe, know who the law affects. Not doing so is unethical. Would it have been preferable to stiff the guy and not leave the card? Is it preferable to something unfair and explain why, or just do it and leave ’em guessing? No, openness is ethical. Leaving the card instead of the tip is wrong; leaving the card to explain the absence of the tip is honest. Good distinction to make. Kudos. Maybe those “idiots” Bill O’Reilly and Trump had dinner together there, and left this note ?? If Donald Trump left a note like that to justify not tipping someone, that would end his candidacy. Or give him another 5 point boost. Trump’s candidacy feeds off the frustrations of people who have been shamed into silence (rightly or not) for having viewpoints that aren’t popular. Every time he does something that would lead the traditional candidate to hide under a rock, he gets a boost. It won’t last long…. But we need to stop underestimating low-information voters’ ability to poll like idiots. In any event, it should be interesting to see what the results of a 15 dollars per hour minimum wage will be. Economists seem to be unable to make any kind of prediction they’re comfortable with. Maybe one result so far is that people will tip less. I don’t remember seeing that anywhere in anyone’s predictions. And by the way, I disagree with the notion that tipping is performance based. It’s really a tax or fee. It’s a way in the U.S. to make the customer pay for service so the establishment doesn’t have to. I think people tip according to how generously they are disposed toward the serving demographic. In the U.S. I tip twenty percent because it’s a crappy job that I appreciate someone doing. Here in Holland, the price of service is included in the price the restaurant pays. I don’t tip here. My wife does because she’s a kind hearted American sucker. There’s no such thing as a voluntary tax or fee, Bill. I can, and do, withhold tips for lousy service. Try withholding taxes for lousy service from the government. But stiffing a server is so rare and so “shamed” that it’s virtually unheard of anymore. Cheapskates can always use crumby service as an excuse for saving a fifteen or twenty percent tip, but I’m pretty sure it rarely happens and the food and beverage industry and its workers generally count on most everyone paying between fifteen and twenty percent as a tip. And I’d bet you the waiter you stiff for poor service just shrugs his or her or its shoulders and says, “that guy was a jerk.” Maybe tax is the wrong term. Maybe “cost shifting” is more accurate. And by the way, The Reverend Al Sharpton seems to think paying taxes is optional. And it seems to work for him. My practice when I was last in the USA – before I got banned from entry in 2011 – was (as far as I could) to pay as much as I’d pay for the same thing in Australia. So I’d forego the $7 breakfast for the $5 one, but then pay the $12 I would have paid for either back home. Then a 10% tip if service was truly exceptional, as I do in Australia. “Greasy spoons” – diners – are amazingly cheap in New Orleans, a bowl of gumbo, cornbread, and gator sausage for $5 on Tuesdays, $7 other days.. I don’t see how they can make a profit. We’d use croc not gator, but there’s $8 in ingredients there. Here minimum wage is $15.50, a Big Mac $4.50, with many specials (wraps, egg muffins etc) $2. A good breakfast will set you back $10-$20 though. I really don’t agree with the “tip should be for good service” argument. It isn’t what motivates my tip. As a general principle, I tip 20% for competent service, higher for excellent service, but almost never less than 15%. The only time I do tip less is when the service is unsatisfactory and indifferent. At that point, I’ll generally follow my late father’s example and leave a one penny tip. He/she is a poor employee who should not be in their job (fortunately rare). What I do when I receive poor service is have the manager brought to me, and remonstrate with him or her. I point out the deficiencies and unacceptable nature of them. If the server was in the weeds, for example, the manager himself should’ve attended to the matter and helped the service staff avoid complaints. The rest of the above need no exposition as a matter of management competence. I always point out which of the above situations seem to apply, and point out the failure of management in all of them. Based on the quality of his/her response, I am either satisfied or will later contact the restaurant’s national management or local ownership directly with a formal complaint about both the employee and the manager. After that point, I have to decide whether or not to patronize that restaurant again. Sounds like a lot of work, but it gives me satisfaction that the mere act of withholding a tip does not. I think the issue is that it became customary to tip certain servicepeople, and then that social contract got written into law. It’s very hard to undo such laws, especially when there is no aggrieved party or interest fighting to undo it. The people who would move to positions of power as waitstaff tend to be the people who are better at it, and make more money then they would make if they were paid current regular minimum wage. I know a couple people who have been promoted to management, and switched back to serving as they made more money that way. And since my above comment completely failed to address the substance of the post, I find the protest unethical. The reason is because the patron has no control, and generally no real knowledge of the amount the employee is earning. Further, it is none of the patron’s damned business. So if your raison d’être for giving a tip is quality of service, how can the base pay of the server possibly matter? If the reason is to be fair (as mine above), I have to ask myself if I am comfortable not considering service at all, and that answer must be “No.” Perhaps I would revise my scale should I know that all servers are making a minimum of $15/hour, but by no means would I remove the consideration of good service, which is what you must do in order to carry out the protest. Will a mandatory minimum wage of $15 also spell the end of all workplaces which post the message: “[employee(s)] work for tips only”? It seems that such establishments, with such a scheme of compensating employees, would quickly find themselves on the wrong side of the law, as a result of such a mandate. When it doesn’t apply to tipped employees?